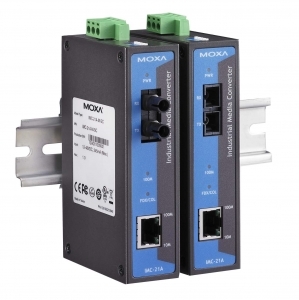 Moxa has unveilled the IMC-21A, a new series of industrial Ethernet-to-fibre media converters. The IMC-21A converts from 10/100BaseT(X) to 100BaseFX and is designed to meet the demanding requirements of critical applications: it can operate reliably and stably in a wide temperature range of -40 to 75°C and is housed in a rugged metal case. To prevent data transmission failures, the IMC-21A series includes Link Fault Pass-through (LFP). Typically, when one side of a link fails, the other end of the link continues to transmit packets, waiting for a response that will never arrive. LFP forces the link to shut down as soon as it notices that the other link has gone down, giving the application software a chance to react. The IMC-21A series is DIN-Rail mountable and is available for order now. For more details, visit here. * Power inputs: 12 to 48 VDC. * The TP port’s connection speed, half/full duplex mode, and force/auto mode are all selectable by DIP switch. * Multi mode and single mode models with SC or ST fiber connectors are available.